You’ve just had a beautiful, functional roof installed, and you notice it’s beginning to grow moss. It’s inevitable here in the Pacific Northwest, but that doesn’t mean it’s any less frustrating. Or maybe you find that moss adds character to your home. Unfortunately, moss is more harmful than it may look. Moss absorbs water, then it grows roots. These roots get under your roof shingles over time, which creates open air space. That allows moisture to get in. Once moisture is there, you can expect rot and leakage. Meaning: Big problems! Therefore, it’s important to remove moss as soon as you see it. There are certain steps to take to make this job as easy and painless as possible. The trouble with moss is that in wet climates like ours, the moss turns into a mat that can become several inches thick, which then acts like a sponge, soaking up every bit of water that falls. This then soaks into all sections of your roof, potentially wreaking havoc on your new roof. So as lovely as you might think it looks, it’s important to make sure that moss is eradicated. You may be tempted to take an overzealous approach in an attempt to rid your roof of moss, it’s essential that whether you decide to brush or scrub your roof you don’t do it too harshly as that can also damage your shingles. 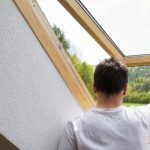 The same is true of power washing, as this could tear or damage your shingles, or allow water to become trapped underneath your roof, which is the opposite of what we’re trying to do. Slowing moss growth is ideal because instead of doing one massive cleaning every few years, that can degrade your roof, yearly proactive care is ultimately in the best interest of the long-term life of the roof and prevents moss build up in the first place. Give your roof a light sweep: When moss growth is in its infancy, often you can remove it by just giving a gentle sweep. However, it’s incredibly important that you don’t break or loosen any of the shingles. If you brush too hard, you risk breaking off the protective mineral granules on your shingles. A simple sweep with an indoor broom works best, rather than a long-handled push broom made for the outdoors. Prune your trees: When you look at your roof, you’ll probably notice moss grows primarily in shaded areas on your roof. We aren’t advocating to chop all your trees down (please don’t do that! ), but trimming or thinning out the branches allows for more sunlight to get through the canopy and onto your roof. This lets your roof dry more quickly, making it more difficult for moss to grow (since moss likes damp, wet areas). Keep your roof free of debris: Almost everyone’s roof has fallen leaves and twigs scattered around the shingles, and gutters frequently collect their own debris. What you might not know is that leaves and twigs provide nutrients for the moss, and make it easier for moss to spread and grow. Keeping leaves and twigs off your roof helps keep moss from spreading. Look for algae-resistant materials: There are algae-resistant shingles, but those are normally installed when you’re getting a new roof altogether, which hopefully isn’t occurring very frequently for you and your home. The good news is there are algae-resistant materials that don’t require an entirely new roof. 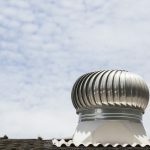 Consider installing zinc or other metal strips along your roof. You slide these under existing roof ridge shingles, and they will help kill the moss or lichens that were growing there previously. What happens if you don’t clean your roof regularly? Moss does not cause immediate issues, but rather slow-moving, long-term damage. Beyond being unsightly, moss growth can damage wood shingle and shake roofs as well as asphalt shingles. As it collects rainwater, the moss can rot the roof surface away over time. Even worse, it can be damaging to you and your family’s health by facilitating mold growth. How do you know the moss problem is bad? The most telltale sign is looking at your roof; if the moss is thick and blanketing the shingles, you have an overgrowth. You can also check in your attic and see if there is any water damage or moisture coming through. If the problem gets bad enough, most people opt for a deep cleaning with a chemical solution. This can be done by you, or you can opt to call professionals. What happens if you still can’t get the moss off? You’ll need to take some extra steps, so first, head to the hardware store. There are great spray cleaners for your roof. We recommend Bayer 2-in-1 Moss and Algae Killer, Wet & Forget, and Moss B Ware. You could make your own at home, too, with the right recipe. You’ll want to wait for a cloudy day to get to work on this. This is because a sunny day will cause the cleaner to evaporate before it’s set in. When you’re ready, apply it on the roof, then gently scrub as you did before. Cleaning moss is a seasonal job. If you are proactive, you can take steps which make it harder for moss to grow back after removal. Once your new roof has been cleared of moss, zinc strips or copper flashing can help prevent future moss problems, extending the lifespan of your roof. Additionally, keeping your roof clear of debris, such as leaves and twigs that provide nutrients for the moss and facilitate its spreading and growth. Pruning and thinning your trees to allow more sunlight through to your roof can also help prevent moss growth since it allows your shingles to dry out more quickly after rain. Keeping your roof looking like new may be slightly more difficult in southwest Washington, but it’s worth the effort. If you have questions about moss removal, new roof installation, or roof repair, give our team at Warner Roofing a call. With our expertise, friendliness, and professionalism, we are your resource for any roofing questions you may have.